Npower is the hottest thing in Nigeria now and we all know this. With the engagement of nearly 500,000 unemployed youth in this part of the world, only a sycophant will say it’s nothing. The programme doesn’t limit itself to giving N30,000 monthly stipends to the beneficiaries form N-Teach, N-Agro and N-Health categories, it also trains, certifies and empowers the N-build participants with the monthly stipend of N10,000 instead. The N-Tax, which is under the Ministry of Finance, is more rewarding for the affected graduates. In addition to this, all beneficiaries are entitled to devices which are customized gadgets which aim at providing information and resources to help participants carry out their duties judiciously. Collection of the device is the next thing you expect after your monthly allowee keeps flowing. Now, you have good news - yours will be available for collection anytime sooner. This is concluded based on the teasing by the support team. The team just announced that devices are on their way in an indirect way through their Twitter handle. Though the update didn’t let the cat of the bag, yet we’re sure what it was all about. The update didn’t only inform us about Npower device, it shows a video clip of it being used. Speaking from experiences in 2016, this was how the team teased to let the beneficiaries know their devices were coming. With all indications, the 2017 beneficiaries should be on the lookout too. What Are the Npower Device Meant For? 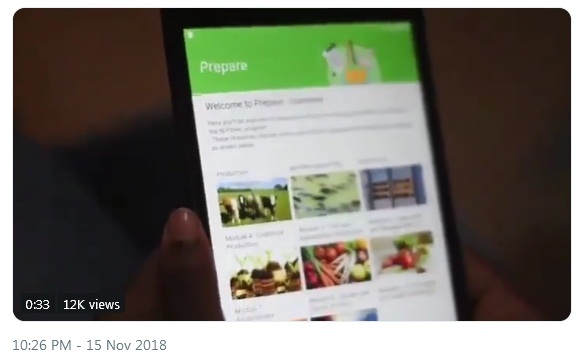 Should you want to know what these tablets are, they contain videos and texts on managing classrooms, list of crops in Nigeria, climate-smart agriculture, classroom-based scenarios, textbooks and workbooks, robust manuals and content for self-development. Will You Pay for the Device? Earlier, the 2016 candidates were told government would be deducting certain percentage form their stipends on monthly basis to pay up for their device. However, till the end of the programme (still continue), no such charge was effected or reported. When and Where are we to Collect the device? Obviously, Npower has collection centers across the states. However, they have not released the report as to when to proceed for the collection. To know when the devices are available and where to collect yours, subscribe to this blog to receive an email update from me. What are the Devices to Expect?